Calendly is one of the best tools for one-to-one scheduling. You create a personal scheduling page. 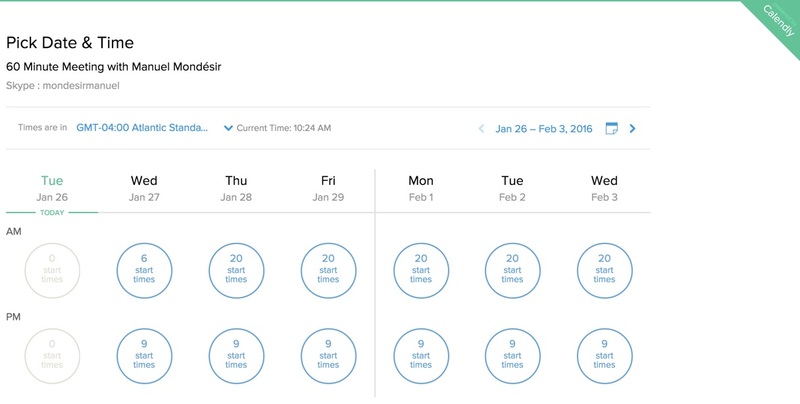 You connect your calendars and set your weekly availability preferences. You share your link with anyone asking for a meeting. They pick an available time and an email is sent to everyone with the meeting confirmation. Vyte is a free Calendly alternative, with a beautiful design and a great user experience. Vyte does not support pooled availability for teams for now (available soon) but offers some extra features that are some limitations in Calendly scheduling software. The more significant Calendly’s weakness is that, at meeting confirmation, your invitees receive an email with the final meeting but this meeting is not automatically added to your invitees’ calendars. What sometimes happens is that your invitees end up forgetting about the meeting or when they receive a reminder, they already booked a meeting at the same time. You need to reschedule the appointment which is a waste of time. Click here if you want to try vyte, schedule meetings faster, now. Or go through the points below that point the main differences between Calendly and Vyte. You just add in your link the duration that you want to accept to prevent people from booking you an hour when 15 minutes are enough. For example, with my Vyte link vyte.in/emma/15, people can only book 15-min meetings with me. Vyte automatically detects your invitees’ language thanks to the language they set in their web browser. Your scheduling page will be displayed to them in their language if that language is supported by Vyte (French, Portuguese, English, Italiano, Deutch, Español and Svenska). If not, your scheduling page will be displayed to them in English. In short, Vyte should be available in more languages. If needed, they can click on the “Link my calendar” button to link their calendar. The detail of their calendar is displayed in the calendar view aggregated with the display of your busy times. It is very easy for them to pick times that work for everyone. Outside of English-speaking countries, the terms a.m. and p.m. are seldom used and often unknown. With Vyte, times are displayed in the calendar view in military / 24 hour time which is massively used in the world. Contrary to Calendly, you can also let people suggest multiple time options. Which can be very useful if you want to have the option to approve the time that suits you best. When someone suggests times on your Vyte page (your personal booking page), these times are pre-booked in your calendar as Options to prevent double booking. Contrary to Calendly that asks you to set a pre-fixed place for your meeting requests, Vyte offers the option to let your invitees suggest places that are convenient to them. You can suggest in the message box on your scheduling page a list of preferred places. Contrary to Calendly that auto-confirms all your meeting requests on your scheduling page, Vyte is a good Calendly alternative if you want to approve meetings before they are confirmed. It is very useful if you need to add extra invitees and let them suggest available times. Or if you want to suggest another time or another meeting duration if you think that the meeting duration is too short or (in more cases) too long. Vyte is a great Calendly alternative for re-scheduling meetings or appointments. With Calendly, the only way to reschedule a meeting is to cancel this event and send back a link to your invitee to re-start the scheduling process. On the other hand, Vyte lest you easily reschedule your appointments. With the “edit” button on the event page, you can simply update the date or place of your meeting. Make your changes and confirm the event again when you’re done. An updated invite is sent to the participants. You may also want to re-schedule the meeting because the previously confirmed time is not working any more. You just have to click on the “edit” button and make your new suggestions. A notification is sent to the participants to vote on your new proposals. Vyte lets you easily integrate your scheduling page with your website. You can choose to display either the welcome page of your scheduling page or directly the calendar view to people pick slots in your calendar in one click. Vyte also lets you fully customize the Vyte design with your logo, your company background and a personal subdomain. Here’s an example with one of our customer. Stop wasting time scheduling meetings! Try Vyte to schedule your one-to-one appointments faster.